Defrosting my freezer the other night, I came across some raspberries, which I needed to use up. Not that this is a hard thing to do. I always like to have some frozen berries, when fresh ones are not in season so that I can still have berries with my breakfast – or at any other time of the day for that matter. 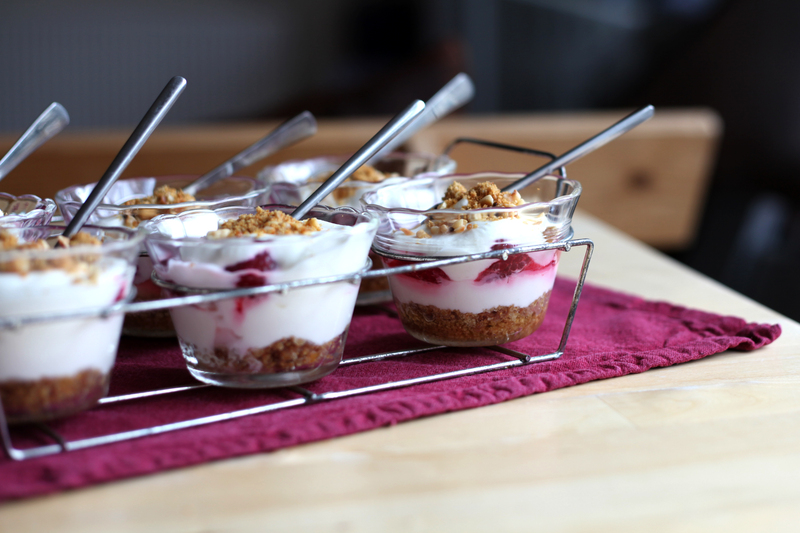 They are great just as an accompaniment for pancakes, stirred in porridge or with yoghurt and granola. For the biscuit base, crush the biscuits until you have fine crumbs. I find the best way to do this is to put the biscuits in a freezer bag and bash that bag with a rolling pin. Melt the butter on the hob, then stir in the biscuit crumbs and spread the mixture between your 8 dessert pots/glasses and press it down with the back of a teaspoon. Leave to set in the fridge for half an hour. For the mousse, start by whipping up the cream so it holds it’s shape. Now, in a larger bowl, whisk the honey and vanilla sugar into the yoghurt. If you have a sweet tooth go for 4 tablespoons of each, the honey as well as the sugar – otherwise start with 3 tablespoons and add more if desired. Carefully fold the whipped cream under the sweetened yoghurt and using a piping bag, pipe half of the mousse on top of your cooled down biscuit bases. Add a layer of frozen berries and then pipe on the rest of the mousse to cover the berries. Break the extra biscuits down to crumbs and sprinkle those on top of the mousse. And/or, for extra crunch, roast small hazelnut pieces in a non-stick pan for a few minutes and, once they have cooled down, add them to the crumbs, as a final finishing touch. You can eat the desserts straight away “semi-freddo style” (though I’d suggest even then to wait about an hour for the raspberries to defrost a little) or transfer the pots back to the fridge, where they will keep for up to 24 hours. This entry was posted in Other and tagged breakfast, brunch, delicious, dessert, easy, easy recipe, healthy, pretty, quick recipe, recipe, recipe with oats, super easy, sweet, tasty, treat. Bookmark the permalink.